This article was first published by Carnegie Moscow Center. After a year of intense flirtation, the Sino-Russian relationship is beginning to look like a one-sided love affair. Indeed, Russian President Vladimir Putin’s visit to China last week—his first since the United States and European Union enacted sectoral sanctions against Russia after Malaysian Airline Flight 17 was shot down in eastern Ukraine in July of 2014—marked a year of frustrated ambitions in China for the Kremlin. Increasingly cut off from Western markets after the imposition of sanctions, Russian leaders initially pinned their economic hopes on a pivot eastward. Russians thought that Beijing would jump at the chance to buy deposits, flood Russia with cheap financing, and hand over essential technologies. The sanctions were expected to make obsolete the “hot politics, cold economics” paradigm of Russian-Chinese relations. However, Moscow’s expectations of greater engagement with Beijing have gone unfulfilled: the volume of trade and investment between the two nations has dwindled as a result of falling natural resource prices, sanctions, ruble volatility, and the Russian economic crisis. In 2011, then presidents Dmitry Medvedev and Hu Jintao announced goals of achieving $100 billion in bilateral trade by 2015 and $200 billion by 2020; initially, these targets seemed attainable. According to a memo based on data from Chinese customs agencies released by Russia’s Ministry of Economic Development, between 2003 and 2012, trade between the two countries grew at an average of 26.4 percent per year. In 2010, Beijing became Moscow’s largest trade partner after the E.U., and it has remained in that position ever since. Over the first six months of 2015, however, Russia’s trade with China dropped by a whopping 31.4 percent, to $31 billion. One obvious reason for the plunge in trade is the downturn in natural resource prices, particularly oil. Fossil fuels account for 61.4 percent of Russian exports to China. Prices of these products dropped by 33 percent. However, natural resource price dynamics are not the only factor in Russia’s decreasing stake in the Chinese economy; they alone do not explain why Russia slid to15th place among China’s trade partners. The overall downturn in the Russian economy is taking a toll. The Ministry of Economic Development forecasts a GDP drop of 3.3 percent in 2015, which helps explain why Russia imported 36.2 percent fewer Chinese goods in the first half of the year. There is lower demand for Chinese goods among industrial and individual Russian consumers: imports of machines and equipment tumbled by 40.8 percent, while imports of knitwear shrunk by 50.8 percent. The only categories in which China’s exports to Russia are growing are meat (up 297.1 percent) and vegetables (up 14.1 percent), and these increases are a direct consequence of Moscow’s food counter-sanctions against the E.U. When Medvedev and Hu announced their bilateral trade goals, Russian hydrocarbons were expected to fuel most of the growth. The Chinese economy was racing ahead with double-digit GDP growth, oil prices were soaring, and the Skovorodino-Mohe spur to the Eastern Siberia-Pacific Ocean oil pipeline was complete, so these goals seemed achievable. Agreements reached last year by Gazprom and China’s CNPC on the construction of the Power of Siberia pipeline—which was projected to be worth $400 billion—seemed like the logical next step. Next on the agenda were the Altai pipeline; a new above-ground pipeline from Khabarovsk or Vladivostok; and Novatek’s Yamal LNG project, in which CNPC planned to increase its stake from 20 percent to 30 percent. But collapsed hydrocarbon prices, decreased Chinese demand, and sanctions have pulled the rug out from under these projects: talks on the Altai pipeline have been suspended; Chinese investment in Yamal LNG may not come to fruition; and in February 2015, CNPC scaled back its forecast for Chinese demand for gas in 2020 from 400 billion cubic meters to 310 billion cubic meters. Furthermore, though Gazprom wants China to build a spur from the Sakhalin-Vladivostok gas pipeline, the resource base would be the Yuzhno-Kirinskoye deposit, which falls under U.S. sanctions, making the project much less appealing to the Chinese. The decline in Chinese investment in Russia is indeed evident at the macro level as well: according to Ling Ji, the director of the Department for Eastern Europe and Central Asia at the Chinese Ministry of Commerce, Chinese direct investment in Russia contracted by 20 percent over the first seven months of 2015. The recovery and growth of Russian-Chinese trade will depend above all on the price of Brent crude, as the overall state of the Russian economy and the ruble exchange rate are both closely tied to oil prices. The willingness of Russian officials to substantially improve the investment climate and to create stable conditions for Chinese investment (officials have floated the idea of “advanced development territories” in the Far East) will also affect trade. Finally, the cancellation or relaxation of sanctions would affect bilateral trade, though there is no reason to expect this anytime soon. 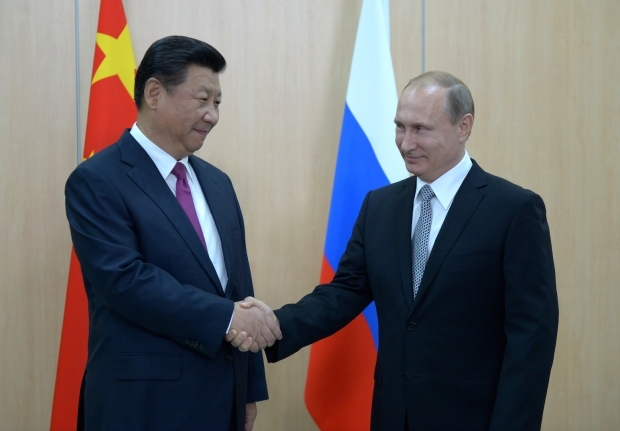 In the current climate, Moscow and Beijing will likely focus on strategic projects. One promising sphere is military-technical cooperation: several Russian experts, including Vasiliy Kashin from the Center for Analysis of Strategies and Technologies, believe that Russia currently has a “window of opportunity” to sell certain systems that China will probably learn to produce on its own in a few years. Another field of interest is infrastructure on Russian territory as part of the countries’ mega-project to link the Eurasian Economic Union with the Silk Road Economic Belt. So far, Moscow and Beijing have discussed several infrastructure projects, including a high-speed railroad between Moscow and Kazan, and a highway from Kazakhstan to Europe. However, these projects will not deliver quick results, and will first require extensive negotiations over their terms.